Love it or hate it, McDonalds is a global powerhouse of deep-fried, super-sized proportions. Started in 1940, the McDonalds golden arches have become one of the most recognizable logos in the world and the biggest chain of hamburger-based fast food restaurants on the planet. As a general rule, deals from the fast food giant come up on a regular basis, whether it's a free coffee, a free burger or a great price on a meal for two. Deals tend to vary by province, so be sure to read any fine print on your coupon. Choose your deal and click. The coupon will open in a new page or tab on your browser. Print the page and bring it with you or open it on your device to show your McDonalds server. 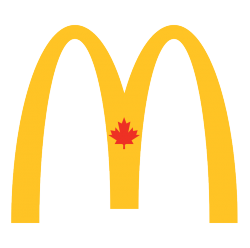 Get your next meal faster and for less with McDonalds Canada. Offering the best menu selections including breakfast all day, burgers, fries, salads and happy meals for the kids. Look here for all the current coupons and discounts on your next app order.